Welcome to our "Crazy" farm. We started with 4H goats in 2009. Our children enjoyed them so much that in 2010, we started to pick out breeding does and a buck to start raising our own 4H animals. In 2011 we succeeded, and our children showed our own stock. We are starting small with 8 breeding does good stock, with a "Quality vs Quantity" mindset. 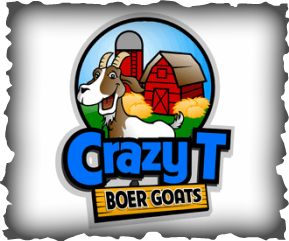 Our goal is to produce quality registered full blood Boers, and quality market goats with 4H in mind. Since we are a bit "Crazy", we love the color red. We have 1 Registered Red does and our first buck was Red. We have purchased a new Buck, SGR Queen of Cat. We are very excited what kids he will bring us next year! Our Farm is in South Eastern Minnesota near Hayfield.